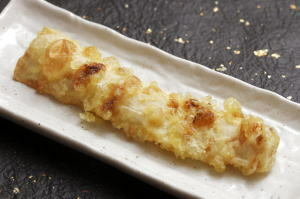 Chikuwa no Tempura ('竹輪[ちくわ]のてんぷら', is classified into deep-fried dish), is known as Tube‐shaped Fish Paste Tempura in English, and 天妇罗炸竹轮 (Tiān fù luō zhà zhú lún) in Chinese. It is the washoku. Egg, Tempura Flour, Oil, Tube‐shaped Fish Paste.